K-Tuned Header - 4-2-1 HONDA - Lightning Motorsports - Selling Speed since 1996 ! The K-Tuned 4-2-1 Header was specifically designed to optimize the performance and power output of your Honda engine. The header was developed using a proven 4-2-1 Tri-Y design that delivers power gains almost everywhere in the power band, not just the higher rpm range. Additional performance is accomplished by using large diameter piping to speed up the flow of exiting exhaust gases. We also use stepped piping and smooth transitions that minimize restriction. Fitment past the subframe and sway bar is perfect with extra clearance available for engine movement. We start with 44mm primaries that smoothly step into 50mm secondaries and finish with a 64mm or 2.5” exit. 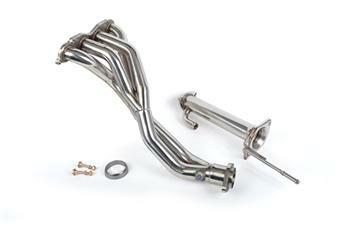 Like all our headers, it is assembled using mandrel bent, 304 stainless steel tubing and is fully tig welded. We also use a slightly thicker gauge tubing that allows for better weld penetration and additional strength. The CNC cut 3/8” thick flanges are also double welded and then ported for optimum flow at entry and exit. This header directly replaces the OEM 2 piece design and eliminates the catalytic converter so we included a short 2.5” test-pipe with defouler for the secondary O2 sensor. Please note that we do plan to offer an option for a cat in the future.